Egg farmers are committed to providing safe, healthy eggs, and they follow several food safety programs on the farm and in egg processing. Providing the best care to hens is a top priority for egg producers. To learn about hen care, visit UEP Certified. What regulations are in place on the farm to ensure egg safety? Who leads these programs? 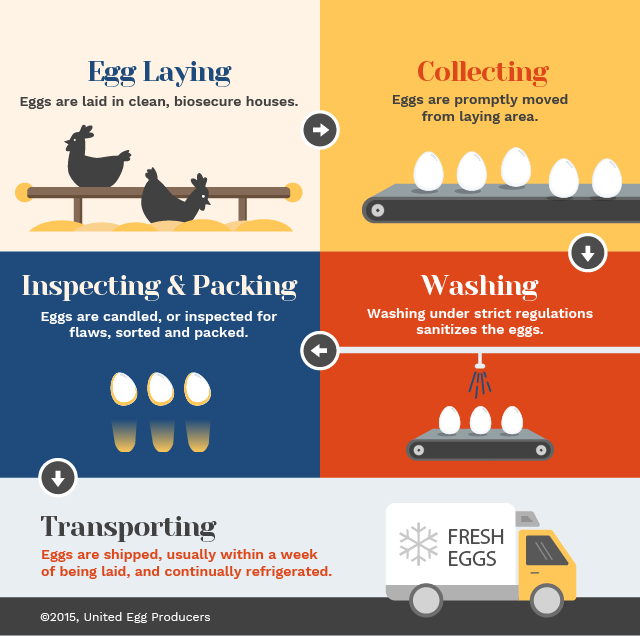 For questions about egg safety on farms, visit our Egg Answers. Commercial egg farms follow strict guidelines to produce safe, healthy eggs and provide care for hens. Eggs must be refrigerated on farm within 36 hours of lay. Eggs are typically shipped from the farm within a week of being laid. Watch this video to learn more. Egg farmers provide hens with veterinary care, fresh water and a balanced diet to keep the birds healthy and produce quality eggs. Rigorous biosecurity and cleaning procedures help prevent disease, and eggs are gathered promptly to provide a cleaner, safer egg. In conventional cage and enriched colony housing, eggs roll directly onto an automated conveyor belt. In cage-free houses, nest boxes facilitate egg collection, minimize hen pecking and keep eggs from litter. Eggs are washed with 110-115°F water, and spray jets, brushes, warm detergent solution remove contaminants. On many farms, eggs are handled by machines instead of human hands to decrease potential damage and exposure to contaminants. Eggs are candled over a light source that allows defects to become visible, and eggs to be sold are sized, packaged and stored in a refrigerated room. Eggs remain refrigerated through transport to stores and restaurants, per FDA regulations. When kept at 45 °F or lower, shell eggs are safe to be consumed four to five weeks beyond the carton’s Julian date.